Who are we to deny of others that which we have freely received? Picture this: It’s Friday afternoon some two thousand years ago. A crowd has gathered around three men hanging on a cross. Two of the men are proven criminals; one of the men is the Son of God who is being crucified basically because He ticked off the Jews. The crowd is taunting Him, yelling all sorts of profane things. He uses what breath is left in Him to pray one simple, yet profound prayer: Father forgive them, for they do not know what they do. One of the criminals hanging next to Him also partakes in this barrage of charades. Though he is guilty and dying deservedly, he can’t help but to make a fool of this man Jesus. But the other is more reflective, more in tune with what is going on and perhaps more aware of the eternal state that he is about to enter into. He uses the last few moments that he has on earth to make one request – Remember me when you come into your kingdom. Jesus’ response: Today you will be with me in paradise. These scenes communicate one very clear thing about the character and attributes of Jesus, the only begotten Son of God – grace. Although people all around Him capitalized on the moment when He was perhaps at His weakest, He continued to pour out mercy, kindness and love. He didn’t do this because they earned it; in all honesty all they deserved was an eternity apart from God. But Jesus gave it anyway, simply because He loved them. “For by grace you have been saved through faith; and that not of yourselves, it is the gift of God; not as a result of works, so that no one may boast” (Ephesians 2.8, 9 NASB). Did you see what Paul said there? Our salvation has nothing to do with anything we did or accomplished, but everything to do with God. So can we boast in it? Can we go about walking around as if we brought it about by our own might and power? Absolutely not, because we did nothing to earn it. Like the two thieves on the cross or the crowd surrounding Jesus that Friday afternoon, we deserved death. But God in His mercy chooses to give us life. Of course, we would be remiss to ever deny others of the same grace we have freely received. And yet, this is exactly what we do. We make people work for grace, we want them to earn their keep! 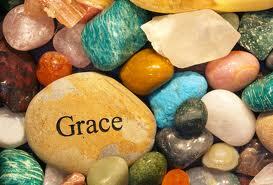 But let us understand, everything we have has been given to us as a result of God’s grace. We didn’t earn it and we never will. There is a horrible ideology that pervades our culture which has crept its way into our churches regarding “government hand-outs” such as SNAP, WIC, unemployment benefits, Obamacare, etc. One of the reasons that people, including many churchgoers, have a difficult time with these so called handouts is because they feel that the recipients haven’t done anything to earn them. Yet this is what grace does; it gives what is not earned to people who need it the most. Who are we to deny them?